The Lower Modernisms – 064. 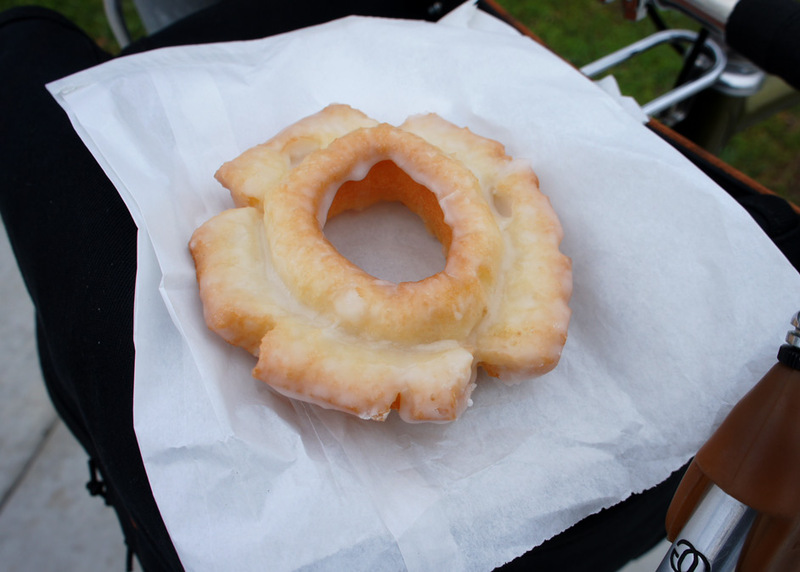 Lomo Featured Project: The Donut Hole. The Giant Donuts of Los Angeles. Lomo Building Types. May 30, 2016 by James Black. 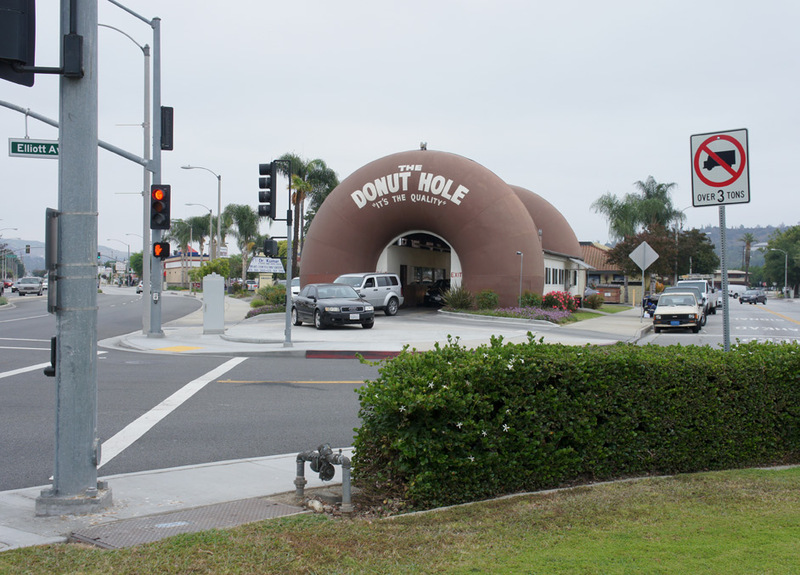 According to the LA Conservancy’s website, the Donut Hole, at 15300 Amar Road in La Puente, was constructed in 1968. 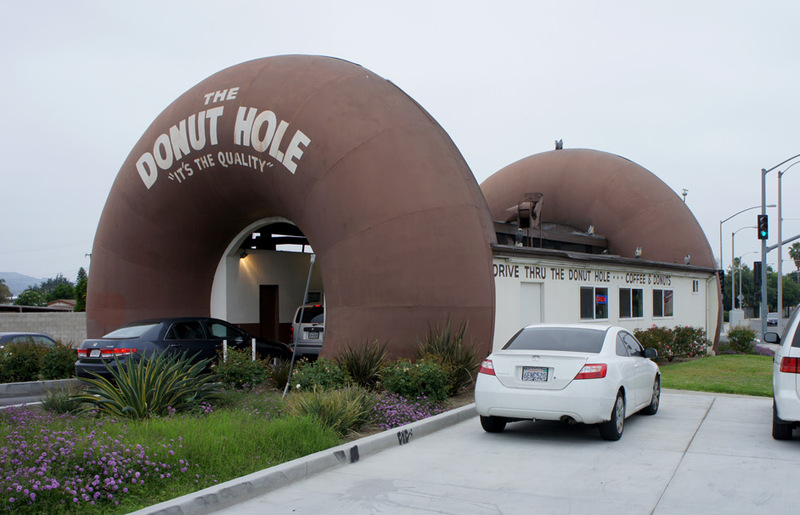 Unlike the other giant donut buildings in which the donut is a sign appended to the building, the Donut Hole legitimately integrates the donut into its architecture, technically qualifying it as Programmatic Architecture, meaning that the building resembles the product on sale therein. If Randy’s Donuts et al. are literally decorated sheds, then the Donut Hole is something closer to the Long Island Duck. 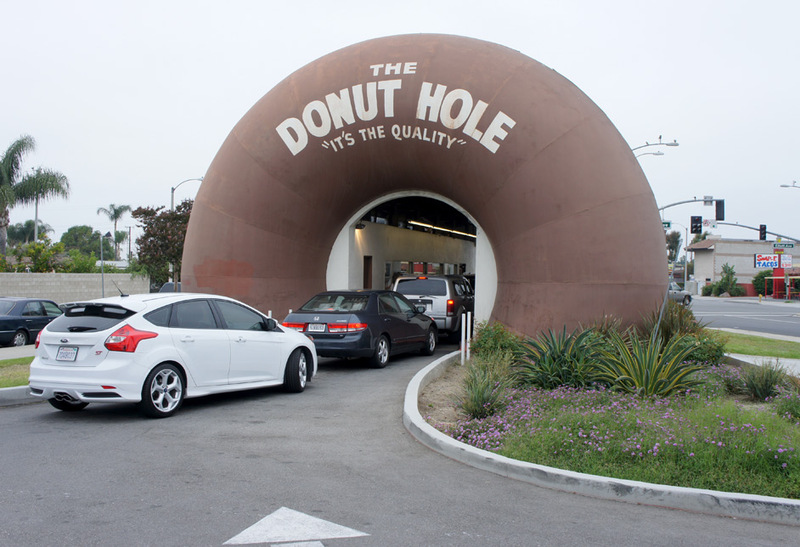 The Donut Hole is conspicuously sited in a narrow promontory of land at the junction of two roads, and it is itself a drive-through building, capped with the arch of a donut at each end. These are semi-circular arches, so I suppose they qualify as Romanesque. It might seem to go without saying that such a building should qualify as a specimen of Lower Modernism, and this is accurate for both programmatic as well as formal reasons. 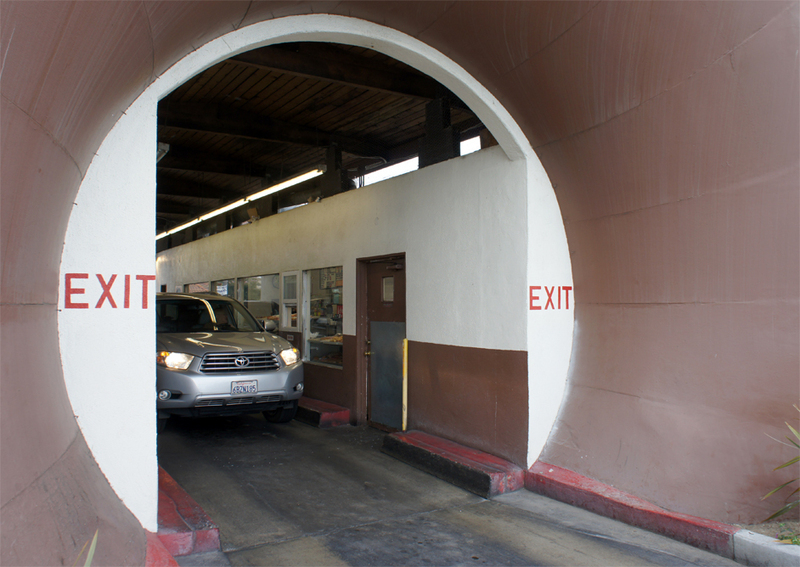 A mid-century drive-thru donut stand occupies the Lomo crossroads where modernity intersects laziness. Subtract those fiberglass donuts and you are left with a building of generic plainness. Owls protect it. 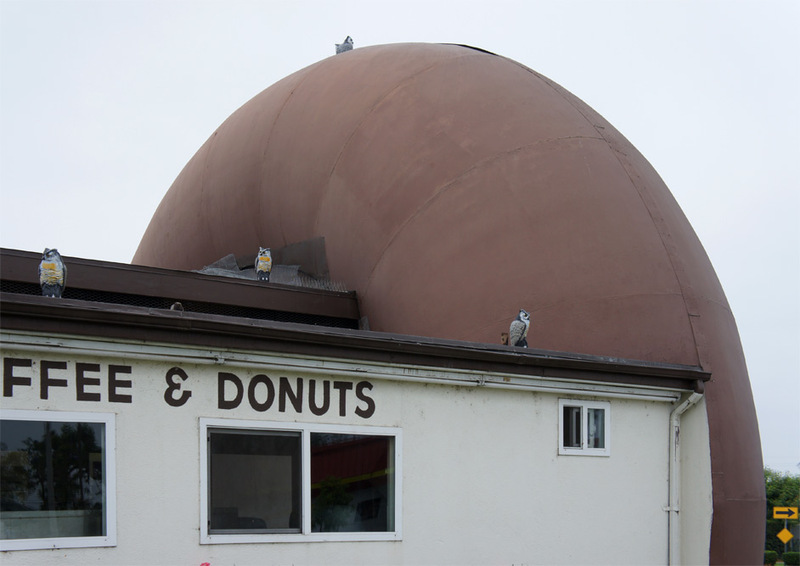 Donuts aside, the Donut Hole consists of two stuccoed rectangular volumes on either side of a driveway, capped above by a flat plank-and-beam ramada of a roof, creating an ambiguously indoor-outdoor space that is open 24 hours and in which donuts of all types are on display behind glass. The drive-through lane divides a front-of-house kitchen from a back-of-house storage and utility space. The most similar type of building organizationally may be the drive-thru A-frame Wienerschnitzel, a photo of which you may find here. They serve a great glazed old-fashioned here.